Alabama State rewarded again by the SWAC for its athletic excellence. 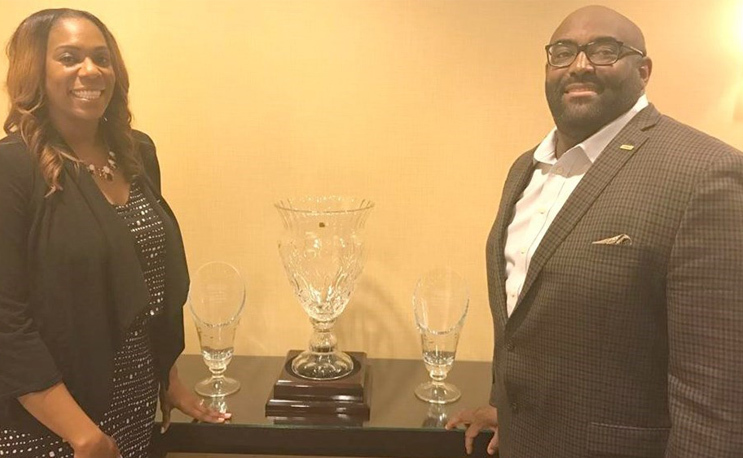 BIRMINGHAM, Ala. – For the second-straight year, the Southwestern Athletic Conference has recognized Alabama State University as the winners of the Sadie Magee/Barbara Jacket Award, C.D. Henry Award, as well as the James Frank Commissioner’s Cup for the 2016-17 academic year. ASU, which swept the three awards last year as well, took 10 SWAC championships back to Montgomery this past year to garner the honors, including first-time championships in bowling and women’s soccer. This is the fifth-straight year that Alabama State has won the Magee/Jacket Award, the third Henry accolade in the past four years, and the school’s fourth consecutive Commissioner’s Cup. The honors were presented Thursday afternoon during the SWAC’s annual spring meetings in Houston, Texas. The Magee/Jacket Award is presented to the top women’s athletic program in the SWAC. Sadie Magee was the first women’s basketball coach at Jackson State, compiling four SWAC regular season titles and three-straight National Association of Women’s Sports National Championships from 1978-1980. Barbara Jacket led Prairie View A&M to eight cross country, nine indoor and five outdoor SWAC track and field titles from 1965 to 1991. Jacket was also the head coach of the 1992 U.S. Women’s Olympic Track team that brought home won four gold medals, three silver medals and three bronze medals from Barcelona, Spain. The Lady Hornets totaled 100 points to beat out second-place finisher Texas Southern (90.5 points) The Lady Hornets captured six team titles, including cross country, women’s soccer, volleyball, indoor track and field, bowling, outdoor track and field and tennis. Alabama State’s softball team finished second in the 2017 tournament as well. Prairie View A&M was third overall with 79 total points. Rounding out the standings are Southern (64), Jackson State (62), Grambling State (53), Mississippi Valley State (47), Alcorn State (46), Arkansas-Pine Bluff (42), Alabama A&M (40). The Henry Award is presented to the top men’s athletic program in the SWAC. The award is named for former Grambling State chairman of the College of Health, Physical Education, and Recreation Department from 1958-74, as well as serving as the executive officer and secretary-statistician for the SWAC in 1968-73. Henry became the first African-American assistant commissioner of any conference office when he joined the Big Ten Conference in June of 1974. Alabama State (73 points) was just 3.5 points ahead of second-place finisher Prairie View A&M. The Hornets finished with 73 points after winning team titles in indoor track and field, tennis and golf, as well as a second place finish in baseball. Coming in third through tenth, respectively, were Texas Southern (64), Jackson State (59), Grambling State (58), Alcorn State (53), Southern (34), Arkansas-Pine Bluff (32.5) and Alabama A&M (29). The Commissioner’s Cup, named for former league commissioner James Frank who led the SWAC from 1983 through 1998, is awarded to the university compiling the highest combined total of men’s and women’s all-sport points. With 100 points from the Magee/Jacket Award and 73 from the Henry Award standings, ASU took first place with 173 total points. Texas Southern finished second with 154.5 total points as Prairie View A&M came in third with 148.5 total points. Jackson State (121), Grambling State (111), Alcorn State (99), Southern (98), Arkansas-Pine Bluff (74.5), Mississippi Valley State (72) and Alabama A&M (69) round out the final standings.